Yeast. Ah, if only I could say that word like Graham Stewart does, now there's a man who knows his yeast. But worry not. I won't be going to go on about the mysteries of fermentation. No, the mystery I'm pondering today is yeast ownership. 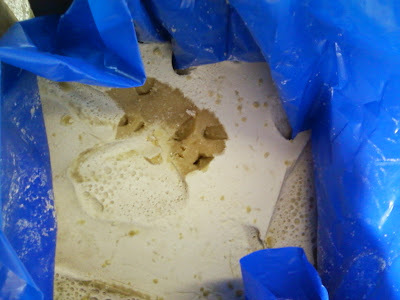 We recently got some fresh yeast in from Brewlab and it was a slightly odd experience getting it. For home brewers they provide a number of strains, none of which have a brewery name attached, but a region and some details are given. I was surprised to find that when I asked about what yeasts they had for commercial breweries I was simply told to let them know what I'm looking for and they'd provide a strain. So I did, and sure enough they did too. But no further details at all. This lead to the pondering. Is it possible to own a yeast strain? 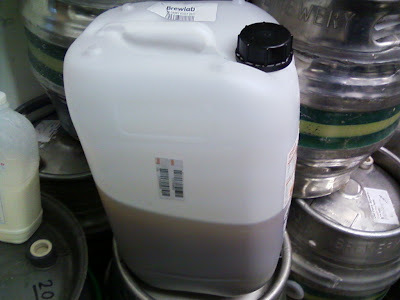 Surely for any cask conditioned beer it wouldn't be too much trouble to isolate and propagate the yeast if you wanted to? No genetically modified yeasts are used in brewing so I don't think they can be patented. All I can think of is that they're being cagey about breweries names in case they infringe trademarks. Does anyone know how yeast strain ownership works, if there is such a thing? On Saturday we were at the Bricklayer's Arms Derbyshire beer festival. If I linked that one in with "White Feather", "Lord Kitchener" and "Assassin" I'd be well on my way. But no plan survives first contact with the enemy. Or the beer in this case. As we'd gone on the third day of the festival half the beers I was after were off, and my Bob based beer bonanza was buggered. Instead I had to make do with whatever caught my fancy and it was dark beers that were doing it for me. I've noticed that recently some craft brewers have been taking the traditional British mild and making the innovative step of adding more malt. This can lead to milds of a staggering 4.5% ABV or more! Muirhouse Magnum Mild fitted this bill perfectly and was beer of the festival for me. 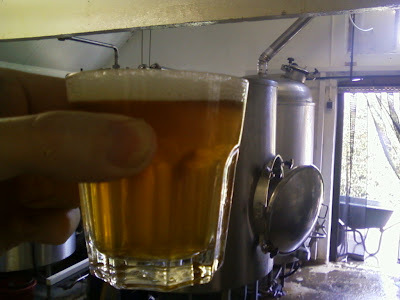 Regular readers of this blog will know that last month we brewed a beer alien to our language, culture, customs and laws. Or lager as it's more commonly known. It's based on a recipe for what was the original and best pilsner before it got taken over and went rubbish. I've had a few tastes of it as the feckless foreign yeast slowly did its work. But after several weeks in the conditioning tank I felt it was really time to test it properly before letting it out into the world. 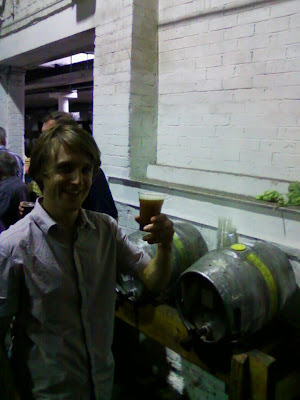 Trying to get into the spirit of things I filled a cornelius keg in the cold store and added some extraneous CO2. 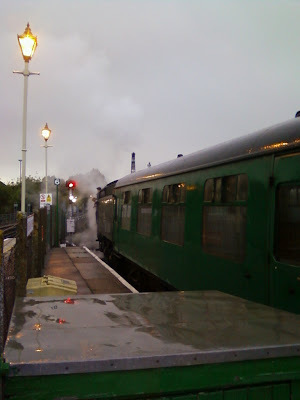 We went on the Real Ale Train on Saturday. 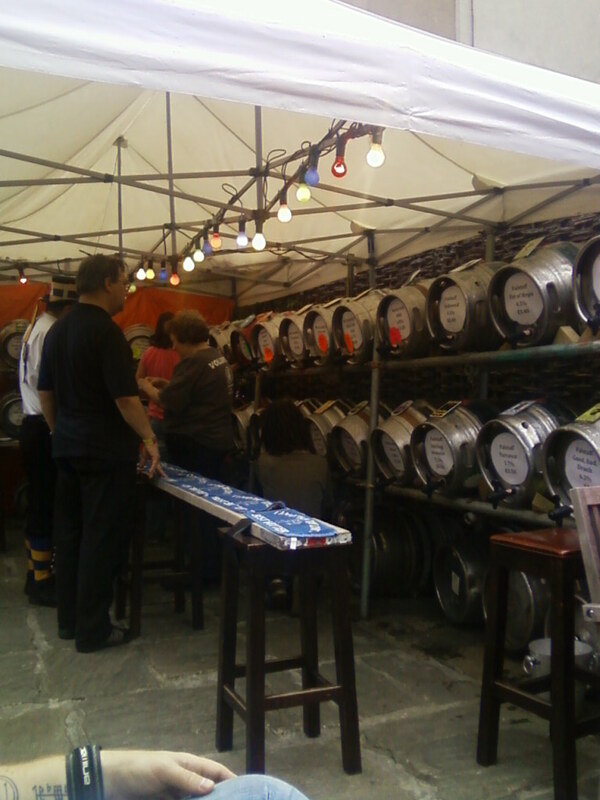 We got to sit in an old railway carriage drinking bright beer out of plastic skiffs. Sounds a bit rubbish really doesn't it? But for some reason it was great fun. 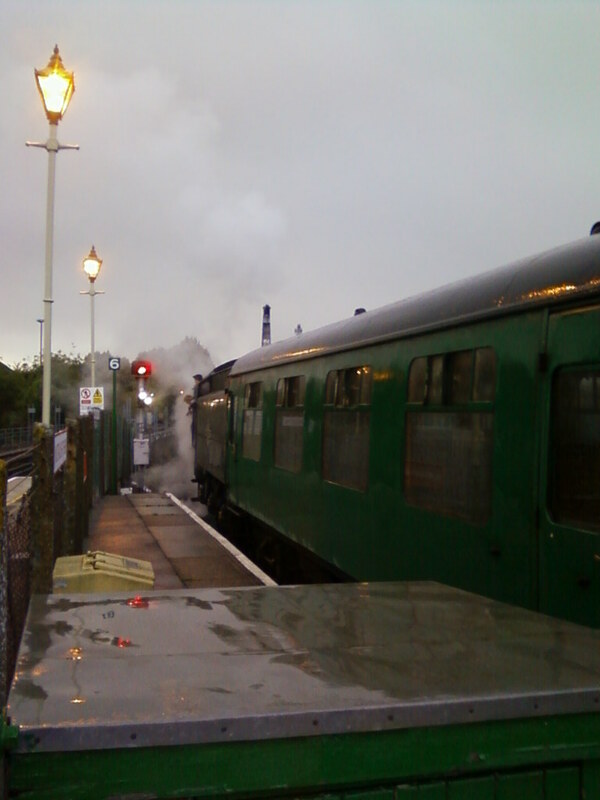 I don't know if it's the fact it's a steam train that adds to the fun. Not being the train spotting type I'm not entirely convinced, though it helps with the atmosphere. Having beer from top local breweries helps too, but the beers weren't at their best. I think it's just getting out and doing something different but still getting to blather on whilst getting bladdered that does it. I've started getting in the ingredients for the beer recipe from 1911 I'm planning to make. 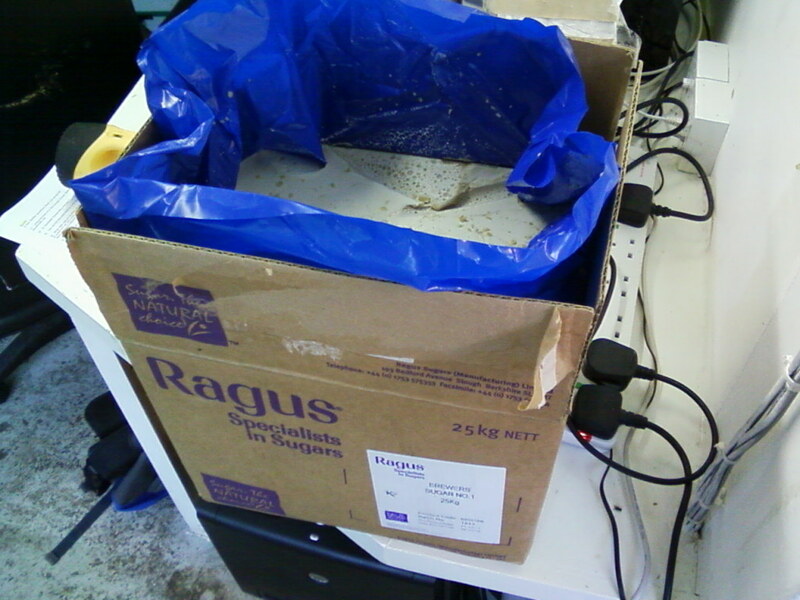 A 25kg block of No.1 invert sugar has arrived from Ragus, and I can see why it's not found in home brew shops. It really is one solid block that looks like it was poured into the bag in the box then left to set solid. It would be a right pain getting it into home brew sized portions. It has a white outer crust and a golden, slightly moist inside. I've tested the organoleptic propeties and it's like honey flavoured tablet. Brewers extact: 321.5 -326.5 litre degrees per Kg (also given as 72 - 73 Lbs/2cwt for any imperialists out there). If I remember rightly granulated sugar is 380 LDK and a moisture content close to zero. If you take into account the moisture content of the brewers sugar its extract is very similar, so not a lot of unfermentable material in No. 1 sugar. I wonder how the darker brewers sugars compare? As ever further research is called for. I noticed today that my last remaining hop has been killed. I planted two back in March, to boldly go on a three year mission to get some home grown hops for our beer. But a pair of plonkers have stuffed that ambition after only six months. The first hop fell to a numptie that managed to strim it clearing a path. That was annoying, but I can understand, accidents happen. 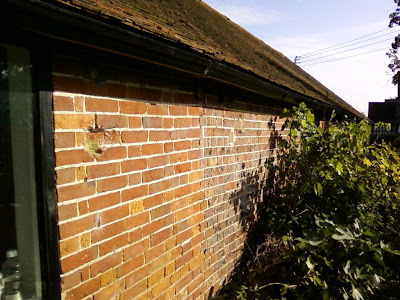 The demise of the second looks like deliberate though - a compost heap has been build where it once grew. In the words of an ex-colleague it buggers belief that a plant, the piece of string it's growing on, and the peg the string is attached to can all be removed accidentally. As soon as I can get a baying mob together I'll be tracking down the perpetrator and explaining to him the error of his ways. Where once two hop grew up string tied to the guttering now there is only blank wall and weeds. 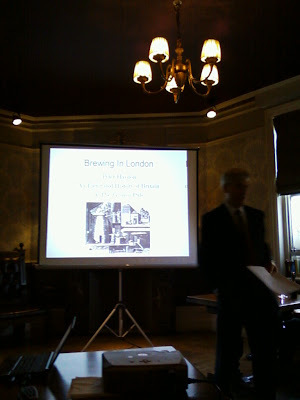 The IBD put on a talk about brewing history in London at the Sloaney Pony last night. I can't get enough of this sort of thing so no way was I missing it. The talk spanned centuries, though unfortunately an urgent call from work made me miss a few decades. But I was still there for the rise and fall of porter. And who'd have thought that brewers referred to their beer as 'mild' for decades after the public had been calling them 'porter'? It was also good to see Martyn Cornell and his blog get a big plug. Before and after the talk I manged to fit in a little light networking (three pints) and there was some interesting gossip to be had. I finally found out that the reason Elgood's did a Hawkwind beer was because the boss of a beer distribution company is a massive fan. And it seems Wells and Young's have followed my lead and brewed Courage Imperial Russian Stout. The also have the rights to the brand so this time its return will be official. I'm can't wait to get hold of some. We made a green hop beer yesterday. 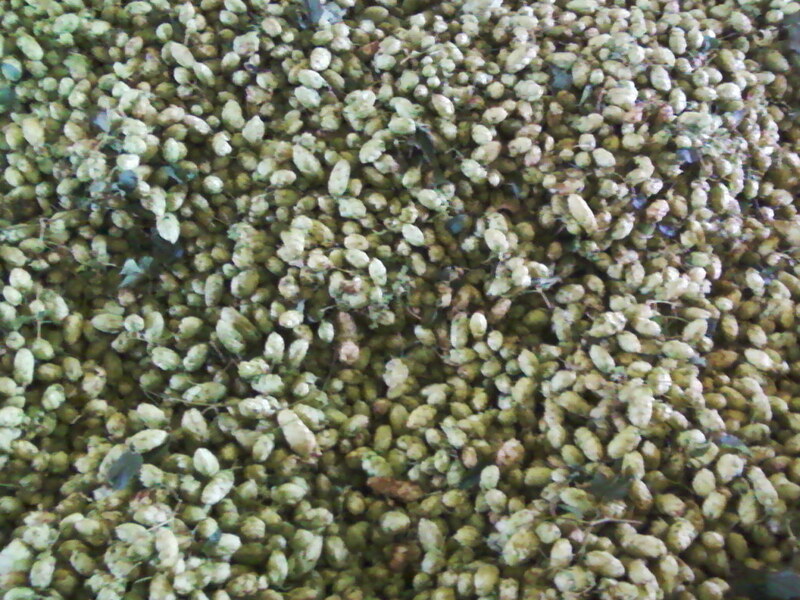 It was good to go back to the hop farm and see masses of the little beauties being readied for brewing. We picked up a sackful of not so readied hops, as they were undried, but with the brewery being about 15 minutes away drying wasn't necessary as they didn't need to keep. It will be interesting to see how the fresh hop beer turns out, and as we used >1kg/hl of hops I'm sure it will be craft beer and therefore AWESOME. Now they have a government majority the Scottish National Party are doing their bit for the English alcohol industry. They're going to bring back plans for minimum alcohol pricing, which must have off licences just south of the border rubbing their hands with glee. I don't boycott many breweries. Life's hard enough as it is without putting constraints on your beer supply. But sometimes it has to be done. 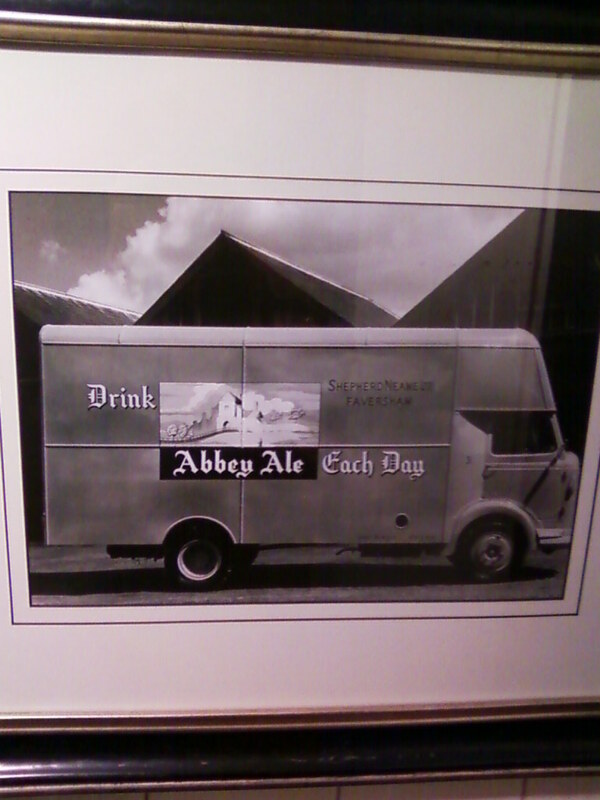 There's the unrighteous brewery I used to work for obviously. They're not getting any of my money. Neither are the twats that make a policy of insulting everyone for PR purposes. Their antics have made me go right off them. I also have a few reciprocal boycotts with friends who've had problems with breweries. Which is only fair really, my friends have been very good at not drinking beers from the tossers I used to work for. One of these is a North Eastern brewery that does an interesting looking range of bottled beers, but they're not for me. Until the GBBF that is. No, I didn't crack and order a pint when pissed, I won a bottle in the tombola. It would be criminal waste not to drink it, and the boycotted brewery hadn't got any of my money. So with a clear conscience I cracked open the bottle and guzzled it down carefully evaluated its flavour. And how did the forbidden fruit taste? It was alright. I was back at Shepherd Neame's brewery last night for a CAMRA award ceremony. As once again I was driving I had limited drinking opportunity, which is a shame as free beer always tastes better and the 9.2% barley wine they'd made on the pilot plant seemed to be very popular. The main even was held in the new visitor centre/museum where some interesting pictures caught my eye. 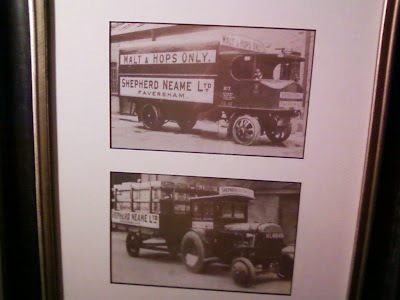 It seems Shep's once had a particularly strict version of the reinheitsgebot as their advertising slogan. 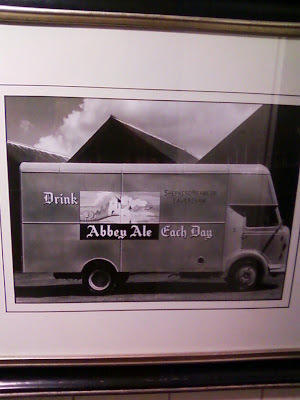 And at one point were keen to promote the regular drinking of Belgian beer.